The Chicago Teachers Union and SEIU Local 73 will continue to fight for an elected, representative school board and progressive revenue for the schools our students deserve. 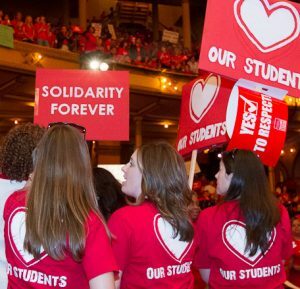 The most obvious win for our movement is that Chicago will be Rahm-less by May 20, for which we have a movement of educators, parents, workers, community organizers and activists to thank. Elections are about contrast, and at least on the surface, tonight’s results represent a contrast to the last eight years. Tonight, the city of Chicago elected a new mayor out of a desire for bold and progressive ideas, and a commitment to building a more fair, just and equitable city. Mayor-elect Lori Lightfoot has her work cut out for her on day one. We did not win class size limits for students in kindergarten, first and second grades, TIF distribution to our school communities, or a special education monitor appointed by the state because we asked nicely or behaved politely. We will aggressively bargain, aggressively defend our platform and aggressively organize for social, economic, educational and racial justice in Chicago and Springfield. The Chicago Teachers Union and SEIU Local 73 have fought for fairness alongside our allies for nearly a decade because our city deserves it. 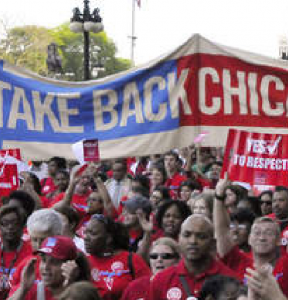 As a movement, we helped defeat the twin privatization forces of Rahm Emanuel and Bruce Rauner. But the millionaires and billionaires who supported them remain, along with astroturf education “deform” groups they fund that continue to support the push-out of Black families, the under-funding and closure of public schools, pension theft, marginalization of democracy and privatization of public services. There is a significant amount of hope for city government, with checks and balances, that represents the will of this movement. Governance in the Chicago City Council will shift significantly with newly elected movement leaders like Matt Martin, Byron Sigcho-Lopez, Jeanette Taylor and Andre Vasquez, who join progressive champions Sue Garza, Carlos Ramirez Rosa, Maria Hadden and Mike Rodriquez. The progressive agenda is advanced by a powerful community organizing presence that was largely built against the policies of Rahm Emanuel, and is committed to taxing the rich and funding our schools. The only reason either mayoral candidate embraced this agenda was because of this presence, and these leaders will hold the mayor accountable to her campaign promises. Congratulations to our endorsed winners whose victories represent a repudiation of the Rahm and Rauner agenda, and the vision of independent political organizations like United Working Families. An openly gay Black woman will lead a city with a tragic history of racial strife and segregation. She will lead the nation’s third-largest school district, whose current leader closed 50 Black and Latinx schools in a single year and fired thousands of experienced Black female educators. Mayor-elect Lightfoot’s leadership must stop the hemorrhage of Black families from our city, prioritize affordable housing and rent control, secure a Community Benefits Agreement for the Obama Center, make the wealthy pay their fair share, and stabilize and fund public services. We expect her appointments to the Chicago Board of Education to be stakeholders—the very people who inhabit communities and neighborhoods that have lost the most under the racist influence of neoliberal school leadership. And to be clear, we do not reach this moment—this moment—as a city without Chicago Teachers Union President Emerita Karen Lewis. Mayor-elect Lightfoot’s work begins immediately. Our school communities need $2 billion and the wealthy must pay their fair share of the bill. School communities need justice and equity; an elected, representative school board; fully resourced school communities; Black, Latinx and veteran teachers in classrooms; and full restoration of our collective bargaining rights. Our parks need to be fully funded and staffed so they are safe and clean, no longer subsidized by an over-reliance on part-time workers who are paid poverty wages with little or no benefits, and provide the programs and services our community deserves. School communities need a nurse and librarian in every building; counselor and social worker staffing levels that meet recommended ratios; special education classroom assistants, teaching assistants and restorative justice coordinators; clean and safe buildings that place our students’ interests above the profits of outside contractors; and 75 sustainable community schools. Our movement will continue to beat this drum, as well as demand adequate special education services and sanctuary for immigrant students. Rahm and Rauner are gone. Their policies must go as well. We hope Mayor-elect Lightfoot separates herself from the dubious interests that funded her campaign, and governs like the progressive she claims to be by ending the funding of #NoCopAcademy and the Lincoln Yard TIF. We expect her to fight for an immediate $15/hr minimum wage in the city, for real and meaningful criminal justice reform, and for equitable investment in all of Chicago’s communities—especially those that have been habitually overlooked and underfunded. We will also demand that Mayor-elect Lightfoot use her authority to make sure that Chicago is a city of unions for all, and that everyone has the opportunity to join a union no matter where they work. If not, she will face immediate pushback. Elections are moments. We are a movement. See you at City Hall on April 9. Teachers can transfer schools without principal permission between April 5, 2019 and May 22, 2019.